It was my brother's birthday a couple days ago and I couldn't find card I liked at the store I went to, so I decided to just sit down and paint him a custom one. 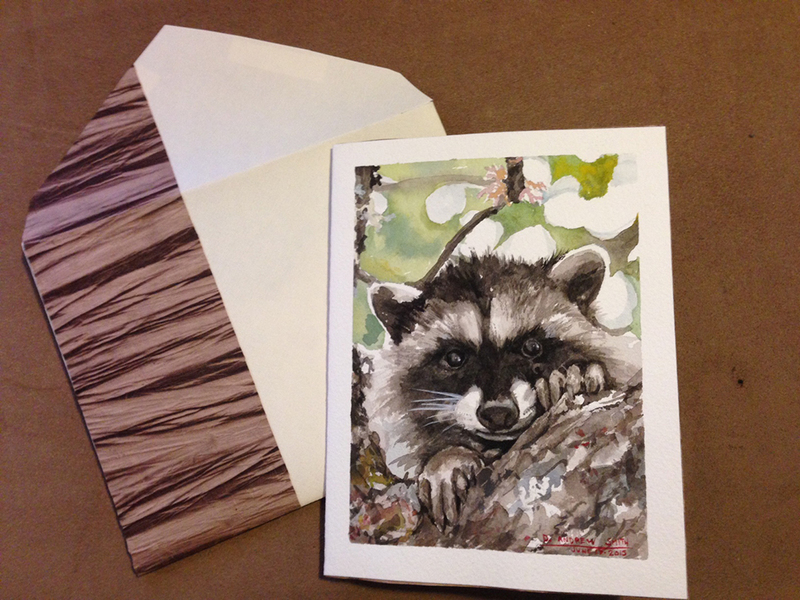 I went through my reference pictures I had taken of animals around the house in Oregon and found one of a raccoon I liked so I painted a watercolor for the front, folded it half, put in an artisan brown paper lining on the inside and then attached a small piece of writing paper on the inside. Then I grabbed a bit of charcoal drawing paper and cut it to size and layout of an envelope using the card as a sizer and used a scrap of the interior paper as an added element to the hand made envelope to tie them together. Here is the result. For a last minute thing, I am pretty happy with how it turned out. I love watercolor for the drying time. I can go from drawing to painting to sticking it in a sealed envelope with very little wait.